The family that plays together… stays together! Friendly competition can create special family memories that last. Give family game night a makeover with these five fun family game night themes. Sure, everyone enjoys a little friendly competition, but when it comes down to it, family game night is all about family bonding. To get started, pick one night per month and stick to it — this way, you’ll all be less likely to make plans and have to cancel. Then, get creative: Pick a new theme each month, and celebrate that theme by dressing up in character and serving themed treats too. Read on for family game night theme inspiration! Mystery-themed games are fun and unpredictable. Keep older kids entertained as they make like a detective and attempt to get to the bottom of the mystery. Encourage everyone to dress up as their favorite sleuth. In addition to the most famous mystery game (Clue), another fun mystery-themed game is a murder-mystery party. Opt for Clue Jr. for your tiniest mystery lovers, or a version of Clue that celebrates your favorite TV show (choose from The Office, Harry Potter or even 24). The only question that remains? Whodunnit?! 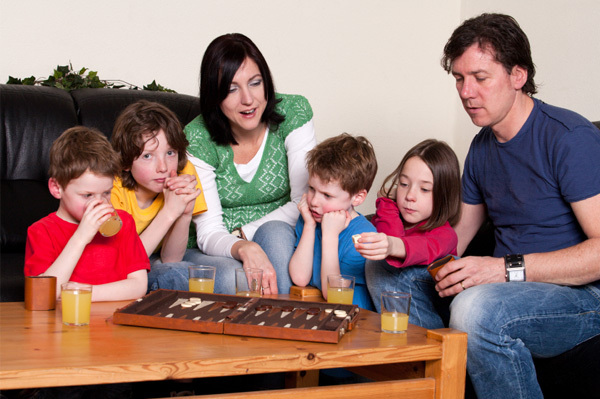 Thanks to action-packed video game consoles like the Wii and Kinect, family game night is now an active adventure. Choose from sports like tennis, snowboarding, bowling, baseball, golf, boxing and even fishing to get the competition going. Make sure each family member dresses the part, whether that means a snowboarding jacket or baseball jersey. Serve up sports-themed cake pops for a tasty treat. An athletic game night will guarantee plenty of team spirit, energy and laughter, so split into teams and get moving! Bring the magic of Hollywood into your family room with a Hollywood-themed game night. Set up a red carpet leading to your TV, and take some paparazzi-style photos as each family member struts their stuff. Encourage everyone to dress up like their favorite celebrity, and serve apple cider in fancy flutes, along with star-shaped cookies. Whether you choose to sing karaoke, play an American Idol-themed game or test your smarts with a game of pop culture trivia, this family game night will make you all feel like VIPs. This family game night is one of the simplest to set up, but also one of the most fun. Simply break out a deck of cards and start playing! Some of our family favorites include Crazy Eights, Go Fish and Uno. Create a cozy setting on the floor for this family game night, complete with a strict pajamas-only dress code, comfy pillows and blankets and hot cocoa and chocolate-chip cookies. With games like Scrabble, Words with Friends and Scattergories, family game night will also be a learning experience. Serve letter-shaped cookies and ask everyone to dress up as their favorite letter. Show your kids that learning actually can be fun with these challenging, yet super-fun family games.